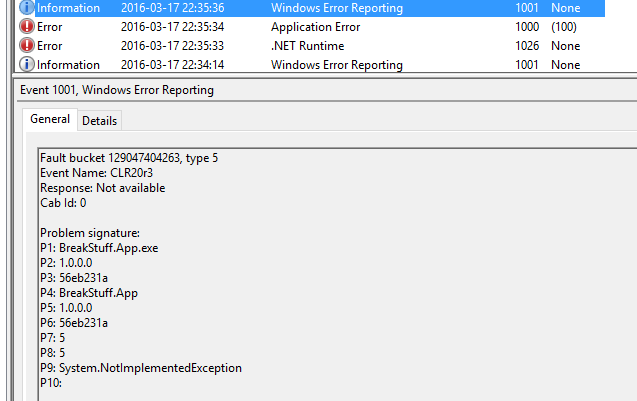 The “Windows Error Report” (WER) is automatically generated by Windows and can be seen in the Eventlog. In most cases, you might see some other - debugging friendlier - event logs. If there is a event log from with the source “.NET Runtime”, then use this first. Windows Error Reports are at first a bit strange to read. Small, but important hint: I strongly recommend that you should use some logging libraries inside your application as well. If you still don’t have a clue where your application breaks or those other event logs are missing the WER can be used to see where the exception is thrown in your .NET application. P1: “BreakStuff.App.exe” = App name or host process e.g. your.exe or Outlook.exe for a .NET addin. P7: “5” = MethodDef – MethodDef token for the faulting method, after stripping off the high byte. This is the faulting method in your code. Super important! P8: “a” = IL offset - in hex, in combination with P7 will it show you the exact position of the exception in your method. P1-P3 should be easy to understand and nothing new to you. If you have a bigger application P4 might lead to the correct namespace/assembly. Most important to find the real source is P7 & P8 - I will show you how to read it. P7 tells you in which method the exception occurred. The number shown in P7 is the method token, which is the IL representation of your actual method in code. To see the real method name we need a tool. As far as I know you could try to use WinDbg, but I was too stupid to use it correctly - ildasm.exe does also work for our use case. 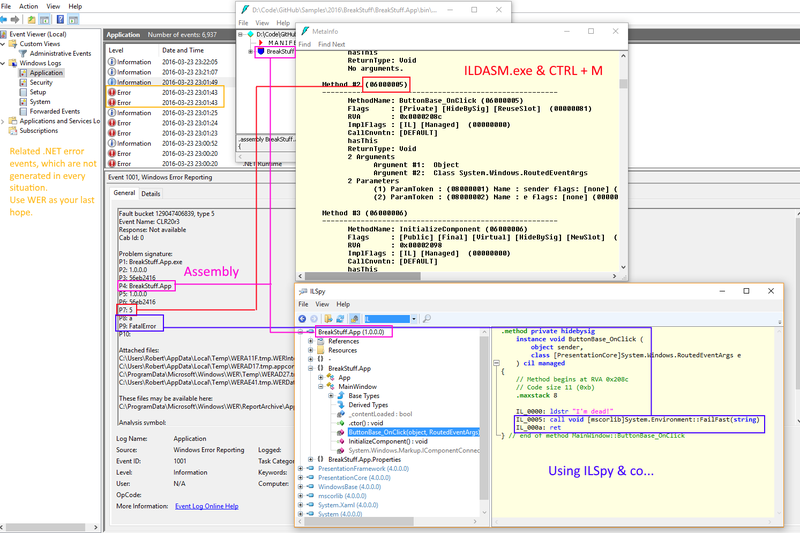 To get the method token you need “ildasm.exe”, which is included in the .NET SDK, which is part of the Windows SDK. For ILDASM it is not important if the actual .NET app is using .NET 4.6 or any other version. “ildasm.exe” itself is not a beauty, but works. Now open your assembly from P4 with this tool. To see the tokens, press CTRL + M and search for P7. BigBasti helped me in the comments to describe the high byte: Big numbers which need more than one byte to store the value have high bytes (most significant bytes) and low bytes (least significant bytes) - you need to know this to make sure you load the sequence of bytes in the correct order. - Thanks! Ok - now we know the actual method. 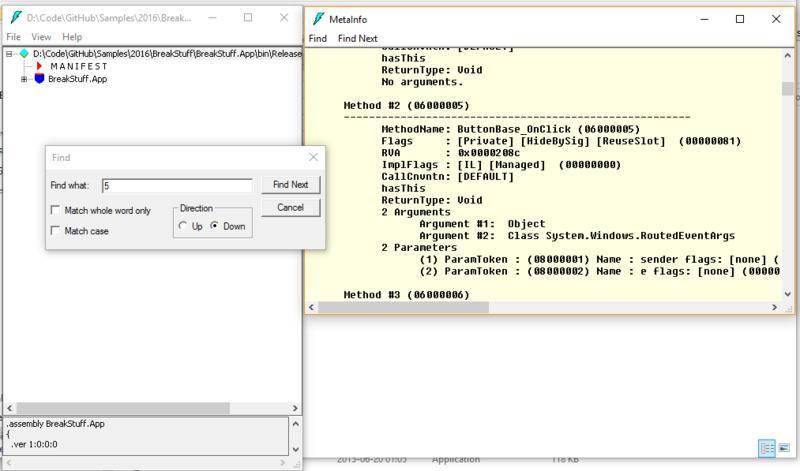 The exception occurs in the ButtonBase_OnClick method! As you might remember - P8 pointed to “a”, which is the IL_000a instruction. Mission accomplished: Exception source found! Yay! I never thought I had to read the internal IL, but we had one weird case where no log files were generated and we used this trick to get to the source of the exception.